Caldwell, Joshua W. John Bell of Tennessee: A Chapter of Political History. American Historical Review 4 (July 1899): 652-64. Grim, Mark Sillers. The Political Career of John Bell. Masters thesis, University of Tennessee, 1930. The Life, Speeches, and Public Services of John Bell. New York: Rudd & Carleton, 1860. McKellar, Kenneth. 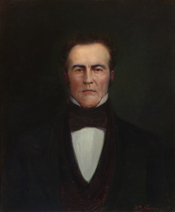 John Bell," in Tennessee Senators as seen by one of their Successors. Kingsport, Tenn.: Southern Publishers, Inc., 1942, 251-261. Moore, Powell. James K. Polk and the Immortal Thirteen.  East Tennessee Historical Societys Publications 11 (1939): 20-33. Parks, Joseph H. John Bell and the Compromise of 1850. Journal of Southern History 9 (August 1943): 328-56. ___. John Bell of Tennessee. Baton Rouge: Louisiana State University Press, 1950. Parks, Norman L. The Career of John Bell as Congressman from Tennessee, 1827-1841. Tennessee Historical Quarterly 1 (September 1942): 229-49. ___. The Career of John Bell of Tennessee in the United States House of Representatives. Ph.D. dissertation, Vanderbilt University, 1942. Scott, Jesse W. John Bell: A Tennessee Statesman in National Politics from 1840 to 1860. Masters thesis, Tennessee A. & I. State College, 1950.